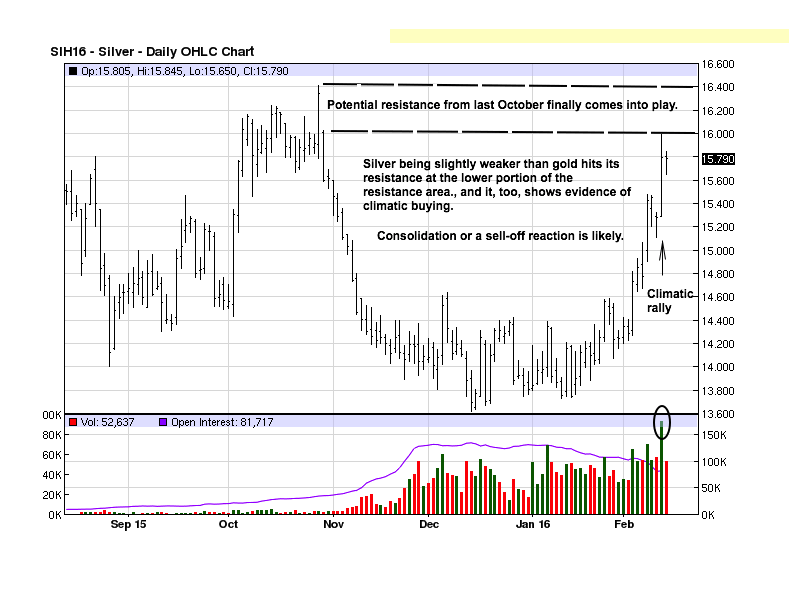 Gold And Silver – Will Precious Metals Purchasers Become Terrorists? A clarification: We tend to use the regular Friday closes for our charts to avoid the closing “fix” that can sometimes be several dollars for gold and several cents for silver away from the end of Friday trade. It is not of much consequence because we are consistent in doing it that way, but two weeks ago, the was a substantial rally after the normal close, and it was not taken into consideration during our analysis. We are on record for consistently advocating the purchase of gold and silver for the past three years, regardless of price. Some may fault us for exhorting purchases at much higher prices than are current. The recommendations were for wealth preservation and not for speculation or profit, even though we can be criticized for the [temporary] erosion of supposed wealth preservation, and in some cases, the erosion is substantial. The timing has been off, yet the reasoning, or purpose for buying and holding remains the same today, and even more pressing. Reuters printed an interesting article, a few weeks ago, from which we will provide excerpts. The full article is here. U.S. eyes ways to toughen fight against domestic extremists. Not to be missed is the lumping of domestic Americans in the same sentence as ISIS. Extremist groups motivated by a range of U.S.-born philosophies present a “clear and present danger,” John Carlin, the Justice Department’s chief of national security, told Reuters in an interview. No mention is ever made that ISIS was created, trained, armed, and still supported by the CIA/federal government. Such pertinent details are not for public consumption. Nor is any mention made that the US is considered the greatest threat to world peace, bringing nothing but destruction to many countries, especially in the Middle East, and/or economic warfare to those countries opposed to US greed and interests, including Europe. A legitimate consideration is, now that domestic terrorists will be treated the same as ISIS terrorists, does that mean the US will now also go after actual ISIS terrorists as it does when going after domestic U.S.-born philosopher terrorists? The French has been trying this, with little success, and what has been happening in France is that protestors against immigrants, some with known ISIS affiliations, the protestors are being arrested while the law-breaking immigrants are being protected. The point is, the US federal government views Americans as suspect terrorists for any reason when dissenting against the federal government. Where is the line drawn? Nowhere to be found. It will not be a far stretch to view those who buy and hold gold and silver as “economic terrorists” The Reuters article, which covers the views of the federal government, mentions a few specific groups or individuals many would [incorrectly] agree that should be called and treated as terrorists, as the federal Thought Police manipulate the public’s mind. However, much of the content in the article is expressed broadly enough to encompass as a terrorist whatever the federal government decides or declares. money. Cash transactions are not recorded in the banking system, and that is unacceptable to those in control. Gold and silver fall into the anti-fiat category and outside of government control. Only those who use or have gold and silver must be against the government use of fiat, and being against the government dictates, gold and silver users must therefore be terrorists not to be tolerated. The window for buying, holding, owning gold and/or silver is closing. Problem, Reaction, Solution. Those dealing in PMs are outside of the system, a Problem. The Reaction is to make it extremely difficult to buy and hold gold and silver, unless it is in open public record where the federal government can come after you. Solution? Brand PM holders as economic terrorists. Sound far-fetched? We have recently discussed how there is no confirmation of a bottom in place, and then gold shoots up in an unchecked rally, seemingly making moot our point. Maybe, maybe not. We are less concerned in calling the bottom than we are in recognizing one is in place. There have been lot of so-called the-bottom-is-in articles that were simply wrong. We have never been in that camp since gold and silver began their step decline over the past 6 years. We may miss a 10%, 15%, even 20% rally once a final bottom is in place, but only in the paper futures market. Our call for the ongoing acquisition and holding of physical gold and silver has never wavered, however untimely some of those recommendations were when gold was over $1,500+ the ounce, silver over $30 the ounce. Like almost everyone else, we did not foresee the globalists exerting so much manipulative influence across all markets for as long as they have. That is past, and we do not use a rear-view mirror for physical purchases made. Are we starting to see a bottoming process? Yes. Does that mean a bottom is in? We do not know, yet. The rally ran into a zone of resistance, seen on the chart. The current rally is but one of many steps in a bottoming formation. Each successive step confirms the one that came before. The next step will be to watch the next downward reaction to see how it unfolds in order to assess the significance of the rally over the past two weeks. The daily chart makes this clearer. What validates the weekly resistance area is the activity on the daily chart. There is no apparent resistance on this lower time frame that shows up over a year ago on the weekly. We have often stated that smart money, aka controlling interests, buys low, sells high. It is also axiomatic that unusually large volume surges are from smart money in action. 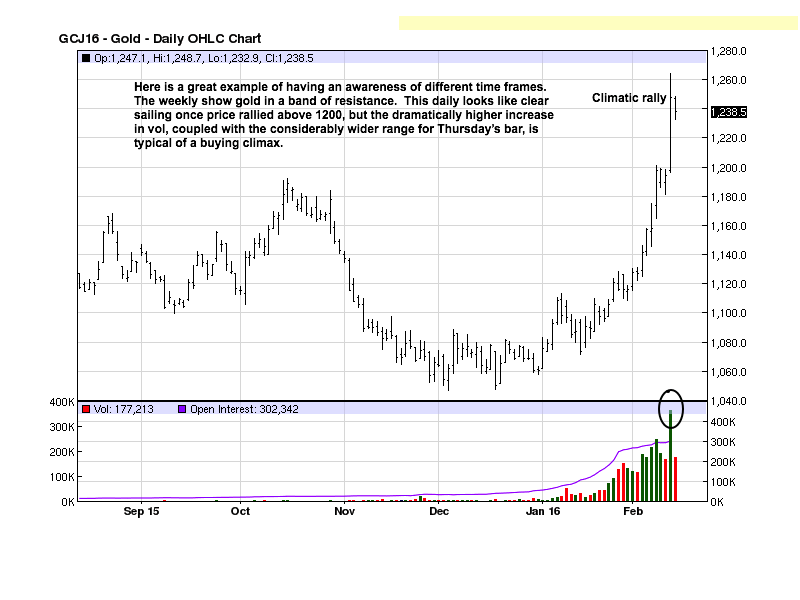 The public simply do not act in such a coordinated effort in concert to create heavy volume days. The public only react. The persistent rally in gold attracted a lot of attention breaking above moving averages and/or above prior failed rallies. The public do not want to miss out on the move higher, and each successive daily high whetted the appetite to want to buy gold before-it-became-too-late. Thus, the huge reaction rush by the public when gold went higher without pause. Guess who were willing sellers to the public at the higher prices? Whenever you see a substantially wider price range in a rally, accompanied by a huge surge in volume, odds favor that day as being a climatic buying spree that ends the rally. 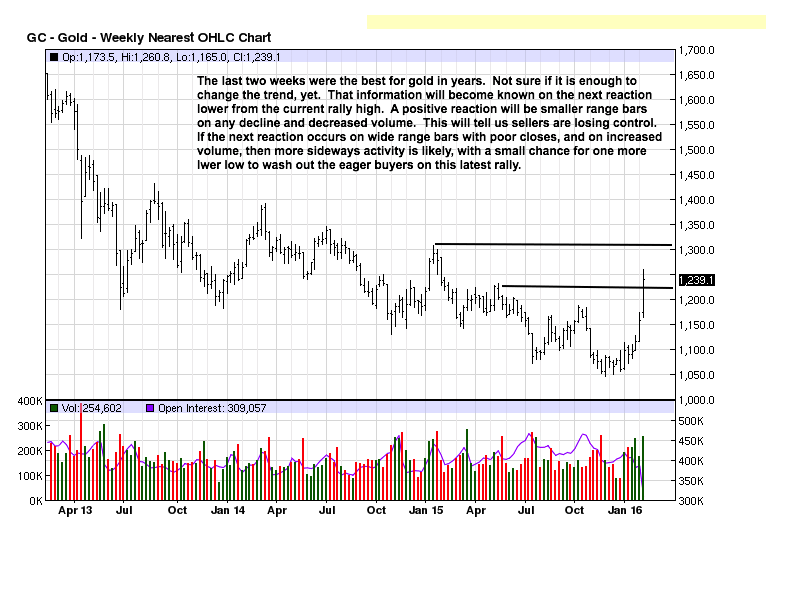 This is exactly what you see on the daily gold chart. A reaction to the downside will likely follow, and it is how the reaction unfolds that will tell us if higher highs will follow, or not. The next week or so may be revealing as to the significance of this recent strong rally. 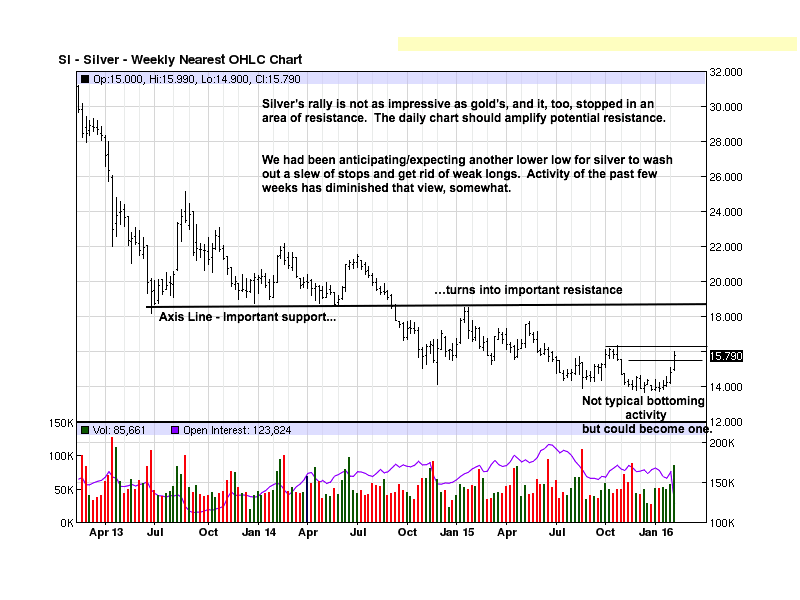 Silver has a much stronger fundamental underlying situation, yet for now, it continues to underperform relative to gold. If the Nov-Dec-Jan bottom trading range is the bottom, it will have fooled us, but it has yet to be decided as to final bottom status. This daily chart cuts off at the beginning of February, prior to the current rally. We want to show how the market provides pertinent information based on past market behavior. There was a swing high established last October when price closed strongly, and it then gapped open lower, net day. The price high is obvious resistance, and so is the high of the next day’s open when price could not regain the gap and continued lower. We drew in dashed lines to reflect how this failed swing high can influence future market behavior, a fact known well in advance. 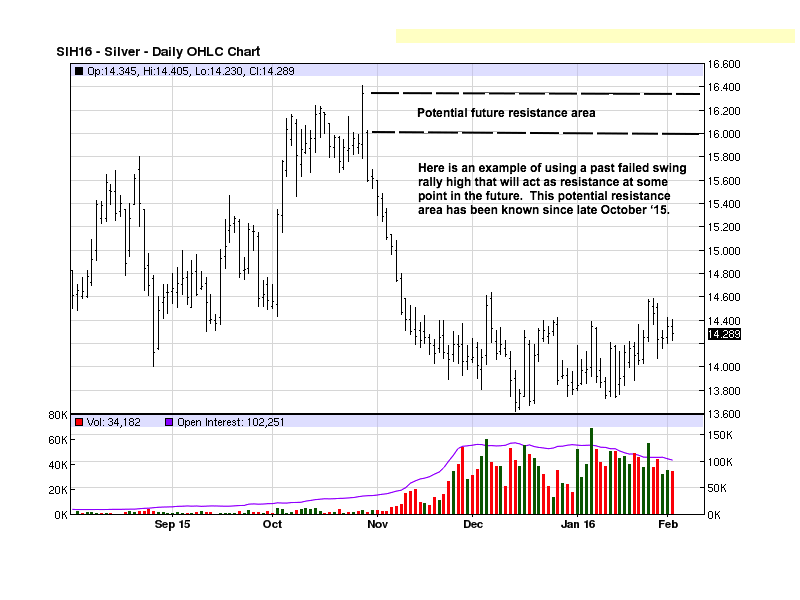 The same horizontal line was in effect when silver rallied to the lower portion of the zone of resistance. A weaker market will tend to fail at lower resistance areas rather than exceed them, as gold did. The unusually wide trading range and the huge volume surge were red flags for a possible buying climax at a recognized area of resistance. We will be more certain of this once any reaction lower unfolds in order to assess the character of any change on market behavior that can lead to a new trend.